Many of you will really enjoy the strange world Mr Ehlers has invented with his songs and music. You can't? Well grab yourselves a copy of 'While The Earth Sleeps' and you won't have to imagine any longer, because what we have here is a group of caustic metal tracks that mix this musician's nightmares with the visceral vocal stylings of an Alice Cooper sound-a-like and 'Crimson Idol' era WASP. What's even more interesting is that this whole album is from the mind and musical talents of just one man. Multi-instrumentalist Mark Ehlers is his name and he is the person (who obviously has a problem sleeping) who has taken his own strange, scary dreams and turned them into a wonderful metal album, that gets darker and weirder the more you play it. Opening with someone whistling 'Jeanie With The Light Brown Hair' lulls you into a false sense of security, as it is just the beginning of the scathing tales that follow. Soon the happy whistling stops and you're treated to that person being whisked aboard a spaceship and then tortured until they scream themselves hoarse. The music then kicks in and from here on Mr Ehlers, who plays everything in sight, pummels you as his angry songs and lyrics attack and bite. Try 'Teacher Of The Black Arts' with it's 'Chainsaw Charlie'-like riff, 'Feed Them Dirt' with its aggressive, angry vocals, 'They've Entered My Mind' with it's driving guitar solo or 'Don't Take A Knife To A Gun Fight' (great title) and wonder to yourself how Mark Ehlers ever gets to sleep at night, with all this dark imagery running through his subconscious mind. 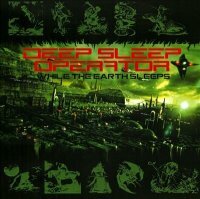 'While The Earth Sleeps' is a very interesting album with an apocalyptic vision of the future, from a man who needs to dream (I think) of fluffy bunnies rather big man eating aliens. That said, listening to this release thankfully didn't cause me to have bad dreams. So please check the band out for yourselves because many of you will really enjoy the strange world Mr Ehlers has invented with his songs and music. 'While The Earth Sleeps' is available at www.deepsleepoperator.com.